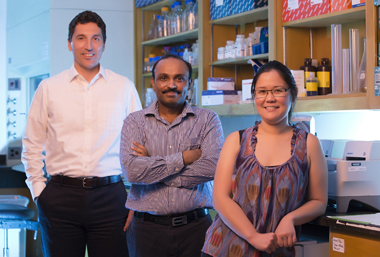 Increasing expression of a transcription factor called KLF2 can promote immunological self-tolerance and “tune down” autoimmunity, researchers at Vanderbilt University Medical Center reported recently. Their findings, published by the Proceedings of the National Academy of Sciences, could lead to new ways to treat autoimmune disorders including psoriasis, diabetes, inflammatory bowel disease and multiple sclerosis. In addition, these findings may provide new avenues to improve anti-tumor immunity that can prevent cancer’s growth and spread. The research was led by Eric Sebzda, Ph.D., the paper’s corresponding author and assistant professor of Pathology, Microbiology and Immunology in the Vanderbilt University School of Medicine, and Sudheer Pabbisetty, Ph.D., the paper’s first author and a postdoctoral fellow in Sebzda’s lab. For several years, Sebzda has been studying the impact of KLF2 on regulatory T cells (Tregs), a specialized subset of white blood cells that maintains self-tolerance and prevents autoimmunity. In 2014, he and his colleagues showed for the first time that KLF2 is specifically required for the generation of Tregs in peripheral tissues (outside the thymus, where many Tregs develop). Early this year, Sebzda’s lab showed that KLF2 is also critical for the expansion and survival of Natural Killer (NK) cells, white blood cells that specifically recognize and destroy tumor cells. In the current study, Sebzda and colleagues found that KLF2 controls the expression of “homing receptors” on the surfaces of Tregs. These receptors enable the cells to migrate efficiently to secondary lymphoid organs (SLOs) including the spleen and lymph nodes. This recruitment to SLOs is essential for Tregs to maintain peripheral tolerance, as demonstrated by the multitude of autoimmune disorders that arise when Treg migration is compromised. These aberrant migration patterns are not observable using standard clinical techniques. For these reasons, Sebzda and colleagues propose that inefficient Treg trafficking to SLOs may be an underlying mechanism which contributes to autoimmunity in patients. Thus, future drugs designed specifically to target KLF2 could, by enhancing peripheral tolerance, reduce tissue destruction associated with autoimmunity. Those that lowered peripheral tolerance could augment current cancer therapies by preventing tumor cells from escaping immune detection. Contributors to the research included Whitney Rabacal, Ph.D., a graduate student in Sebzda’s lab who defended her doctorate July 29, Delphine Cendron, and Vanderbilt faculty members Kelli Boyd, DVM, Ph.D., Danyvid Olivares-Villagomez, Ph.D., Vrajesh Parekh, Ph.D., Luc Van Kaer, Ph.D., and Emmanuel Volanakis, M.D.